“Without increased productivity, it will be impossible to raise living standards in a sustainable way. Notes from the Fourth Industrial Revolution: Asia is the first place on the planet to face off with the worldwide productivity dilemma that is slowly disrupting access to a sustainable way of living. The rest of the planet has time, not much of it, but sufficient time to think and plan and respond. Not so Asia. And nowhere in Asia is the desperation more critically evident than in China. In thirty years China has done what no nation has ever accomplished; it raised up a half-billion people out of poverty and formed them into its first-ever middle class. Such massive success for China’s middle class has come at a severe price to its land, water and air; basics without which the future for everyone is threatened. Polluted air, for example, kills “a million people annually and costs the Chinese economy $38 billion a year.” Or, as the Guardian noted: Beijing’s air is bad, but its water is worse: 85 percent of the water in the city’s major rivers was undrinkable… 56.4 percent was unfit for any purpose. Any purpose! Today, if those half-billion, middle-class Chinese could collectively look over their shoulders in unison, they’d see another hundred million of China’s urban mass racing toward their ranks, with 400 million others getting ready to do the same. The stampede is on. Now what? Well, now that China has produced this gargantuan middle class, it has to somehow sustain it and sustain its middle-class way of living. Like everyone else, they all want a decent place to live, a refrigerator, a stove, healthy food, clean water and air…and all the other basics of modern life. All of which is in jeopardy. So, how does China—and the rest of East Asia as well—amp up productivity? Simply put, it’s all about robots. Making the country as productive as possible is critical and robots are the keys to productivity. Using robots to automate manufacturing is a must-have, and the sooner the better. As such, China is furiously spending billions on industrial robots and robot parts while speedily deploying them and automating as fast as it possibly can. Soon, in addition to industrial robots, there will be critical needs for service robots for everything from healthcare care to agriculture, and much more. Since 2013, China has been the world’s largest buyer of industrial robots. Of the 387,000 industrial robots installed worldwide in 2017, China bought 141,000. That tops out at over 35 percent of the total. According to Junji Tsuda, president of the International Federation of Robotics (IFR), 2017 worldwide sales was $50 billion. China, at 35 percent of that number, forked out some $17.5 billion. Tsuda says sales are up 31 percent year-on-year, and China is far from meeting even its barest needs for industrial robots. 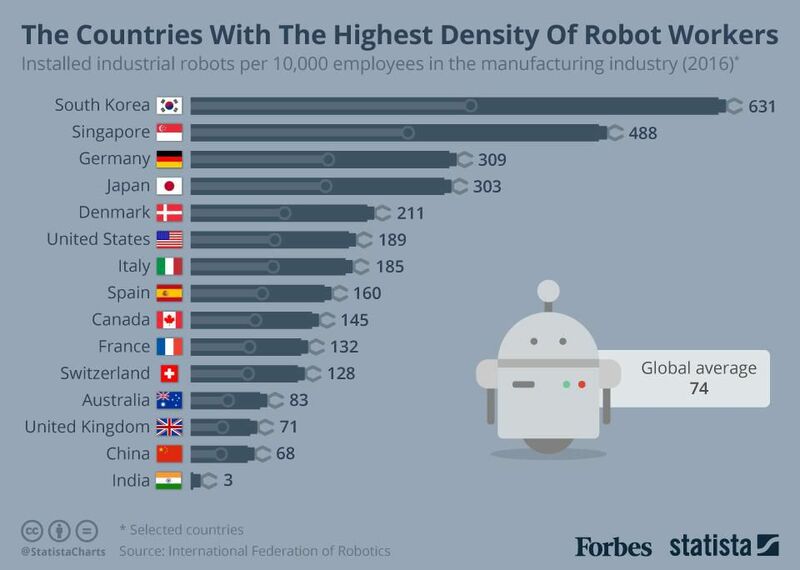 Industrial robot density in China, although still far from world leadership, is 101 per 10,000 workers (2017). Up from 23 per 10,000 in 2013. World leader, Korea, boasts a density of 631 per 10,000. Zhu Sendi, committee member of the National Manufacturing Strategy Advisory Committee and secretary-general of the Strategic Emerging Industries Expert Advisory Committee, sees China at 150 per 10,000 workers by 2020 (a skinny two years off!). All of which means that China’s spree of industrial robot buying is far from slowing down. Rather, it’s accelerating at a rapid pace. When it comes to buying industrial robots, “China appears to be in a class of its own, with its national and provincial governments committing massive amounts of money to subsidize adoption of robots and other automation technology.” Although there has been wild speculation that government payouts are in the tens of billions of dollars, the Boston Consulting Group’s recent tally of government subsidies is more in the vicinity of a $6 billion (out of a total spend of $17.5 billion). 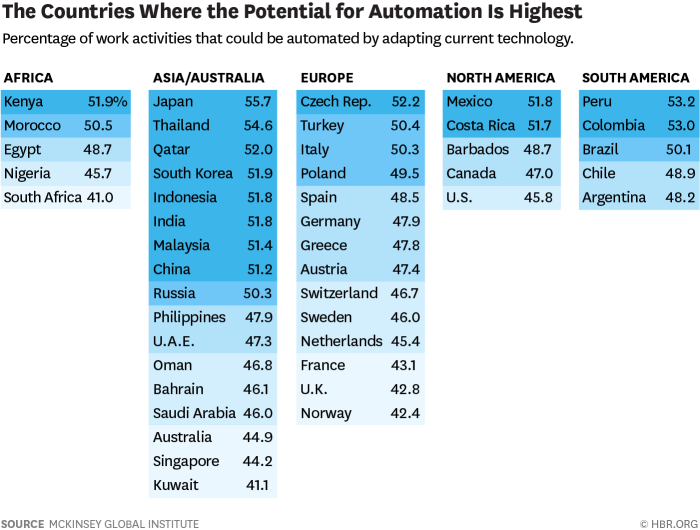 Still, there’s lots more to automate in China, and most everywhere else in Asia as well (see automation chart below). Robert Atkinson, Founder & President, Information Technology and Innovation Foundation (ITIF) is out with an interesting paper that looks not at robot densities per country but at robot adoption rates. 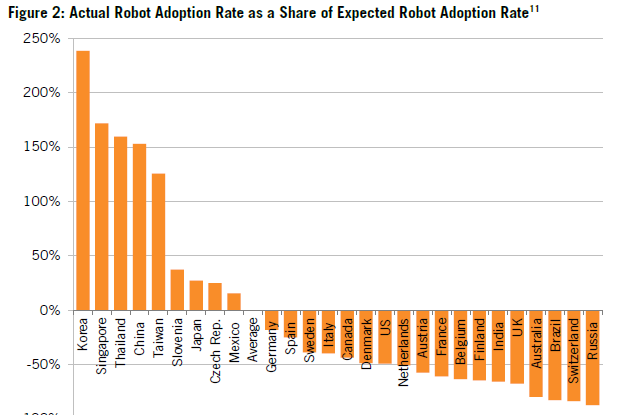 See: Which Nations Really Lead in Industrial Robot Adoption? If the objective is to “raise living standards in a sustainable way,” through increased productivity, then this Asian model for robot adoption could well become the worldwide gold standard; the winning formula for finally snapping out of what The Conference Board calls a global slump.